Discussion in 'Apple Watch Apps' started by AJsAWiz, May 21, 2015. Has anyone tried Day One on their Apple Watch? I've looked on the App Store for notebooks and this one seems promising. It syncs with Day One on your iPhone, iPad and Mac. I have it. I've been a long time user of their mac and iPhone app. It's a fun way to add entries. Not sure how much I will actually use it. Seems like it's best for making a quick entry with a location or meal, etc. It has customizable quick entry buttons and you can easily add the last picture taken, current location, etc. Anything else you are looking for specifically? 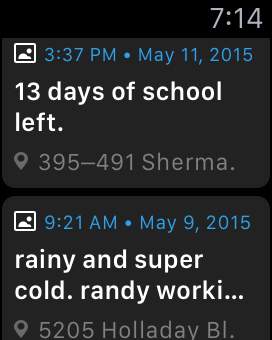 It would be desirable to have a notebook with Apple Watch functionality (so I could read/access notes made). It would be icing on the cake to have full features such as syncing between Mac and devices and ability to add photos/locations (as you mentioned). I'd be more apt to make short notes as opposed to fully journaling. I've been using Circus Ponies Notebook on my Mac for years but don't "see" any Apple Watch integration in the future. You just have one notebook. I know some other apps like OneNote, Circus Ponies, etc. allow more than one notebook. 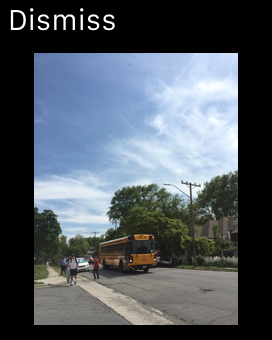 The app does not have glances (yet anyway). You can access previous entries from the app by simply scrolling down from the quick entry screen. If you select one, it pulls up the full text of the note as well as added info (photos, location, etc.) in a scrollable format. Inside the entry you can click on photos to go to the full watch screen size version and you can click on any location info to pull the address right into the maps app on your watch. It's pretty slick! 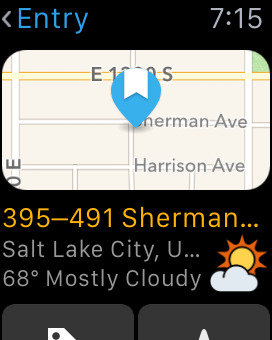 The items in my notebook were existing from my entries via the phone and mac and all were very use-able in the watch app (although some were a bit long to scroll through). 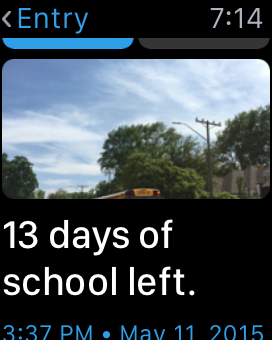 For adding entries, it offers a location button, dictation button, camera button (which pulls up the last couple of photos you took for selection), then six customizable quick entry buttons (defaults are things like reading, working, exercising, eating lunch), then below that are your recent entries. Mine shows 10 entries back. I do not see a way of going back further, so that may be a limitation for you. Watch screenshots are large and pixelated on the mac version, not sure if they will address this. They are a bit annoying. Hope that's some helpful info! Very helpful, indeed! This sounds like just the notebook I'd like on my devices and Apple Watch.